Agency is knowledge in action. The AML has worked with two sets of students to produce an ongoing series of EULAs in Plain Language. First, sickness we identified the most-used media apps or services. 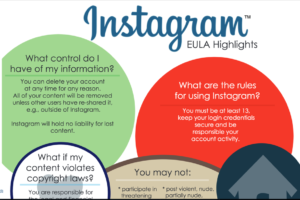 Then, we asked volunteer law students (Pro-Bono Students of Canada) to identify EULA passages that put users at risk and translate these passages into plain language. The passages were re-written in Q&A formats. Finally, the Q&As were designed as posters by Graphic Arts students at Toronto’s Wexford Collegiate School for the Arts. Seven posters are now ready for distribution, with more to come. Simply visit our new page, “I Agree” to download posters for your classroom! The AML hopes that the posters will travel far and wide, sparking conversations and behaviours that will raise users awareness and agency in their uses of electric communications. One Response to "Agency and Privacy"